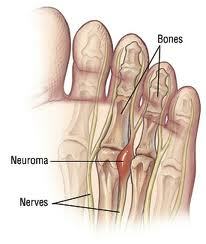 Morton’s neuroma is a painful syndrome of the foot characterized by tenderness and discomfort on the bottom of the foot. The pain is in the forefoot and radiates into the toes. The pain may feel like a burning sensation and there may be numbness and tingling in the toes. It may feel like you are walking with a pebble in the shoe. Morton’s neuroma may be associated with wearing poorly fitting shoes, participating in certain sports and also from certain anatomic abnormalities of the foot. X-rays or MRIs of the affected foot are useful to eliminate fracture of the bones as a cause of pain. Treatment of Morton’s Neuroma includes rest, physical therapy, heat, ice and the avoidance of activities that aggravate the pain. Non-steroidal anti-inflammatory medications are useful to control the pain. Injections into the area with a solution of a local anesthetic and a steroid can be helpful as well.